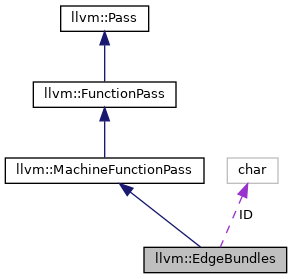 Definition at line 25 of file EdgeBundles.h. Definition at line 38 of file EdgeBundles.h. Definition at line 48 of file EdgeBundles.h. 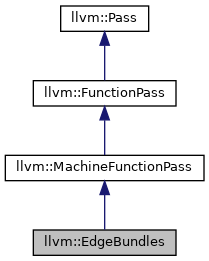 Definition at line 42 of file EdgeBundles.h. getMachineFunction - Return the last machine function computed. Definition at line 51 of file EdgeBundles.h. Definition at line 45 of file EdgeBundles.h. view - Visualize the annotated bipartite CFG with Graphviz. Definition at line 99 of file EdgeBundles.cpp. Definition at line 37 of file EdgeBundles.h.